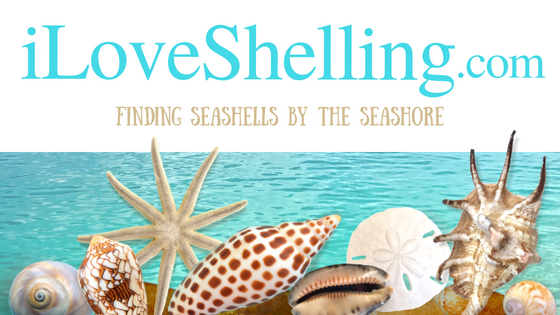 Introducing National Seashell Day June 20! Charge up your shellphones, y’all. Start typing out a few coconut shellegraphs. Use all your shellecommunication skills to tell all your friends about the first annual…. National Seashell Day on June 20! Oooohhh and we have so many surprises for June 20, 2016 too. The biggest one? Ginger Zee with Good Morning America will be here for the shellaganza! Can you believe it? She’s on Dancing With The Stars this season as well – isn’t she so dang cute? Of course we have some spectacsheller events planned to welcome her and everybody at Good Morning America. Ok and there’s one more HUGE fabshellous project I’m working on using lots and lots of seashells . So stay tuned…. We will unveil this big, huge shellmongus seashell “sculpture” on June 20th …. National Seashell Day! Join us on National Seashell Day. UPDATE: So this was my secret project! Can you believe it? 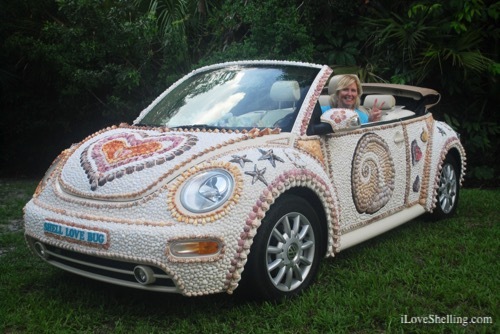 I made a car shelldazzled with over 20,000 shells then named it Shell Love Bug. I’m so excited that I’ll be on Sanibel Island for National Seashell Day which is also the day of my son’s wedding! Shellzam indeed! Hi Gail, Ok lets get you entered! yes, the sweepstakes is on their website and this shows you all the things that are happening that day, you just have to click on the area that says ‘Join the Shellebration” and it will take you to the entry… but for now,…. just click this link http://www.fortmyers-sanibel.com/national-sea-shell-day/ and good luck!!! National Shell Day ! What a great idea! Pam, Had a blast shelling with you in march. Fantastic girls trip to Captiva and our shelling adventure with you was a highlight! My family and I are going on a caribbean cruise to St. Maarten, St. Kitts, St. Johns Antigua, St. Lucia and Barbados. Have you shelled at any of these? If so, do you have any beach recommendations? OMG how unlucky I am. I won’t arrive until June 21st :-( My first visit and I’m still so excited though. I live on the Pacific Ocean so can’t wait to visit the Gulf. Your shells are so different than ours. Pam, where will you be shelling and revealing you big display? Hi Pam – Can we enter each day or only once? Thanks! Are you by any chance doing an “art car” as your sculpture? My home town has unarguably the best art car parade in the entire country, and there are some pretty interesting ones based here utilizing sea shells. (Have to qualify with the word the word “sea” because there are also some I’ve seen over the years with shotgun and rifle shells. This is Texas, after all.) I can hardly wait to see the picture of your sculpture, regardless. What a marvelous idea for dedicated shellers! Hooray! Do you know where on the island there will be activities? Sounds so fun! Wish I could be there! My wife’s birthday and we will be there. Can’t wait to get there with hubby Mitch! And, yes, June 20th is my birthday…#65! Oh this is fantastic. We get to Sanibel on the 18th. It’s kismet. I cannot wait to have a shella good time. Where will the events & sculpture be on the island? Thanks! We are here and ready to shell. YIPPIE! Where do we find a list of events for NSD? Are there shirts for sale somewhere? That’s GREAT, Pam! I will be watching, GMA, bright & early come Monday morning!!! Can’t wait! Does anyone know where on the island GMA and Ginger Zee will be? Also, is there an area of the island where people will be gathering? Love the car, Pam. Yea, it’s my b-day; what a day for National Shell Day. Looking forward to seeing this magnificent VW!!! I LOVE your website!!!! I’m a sheller on Honeymoon Island and down to Sarasota area. Also on our boat and lots of uninhabited islands. National Seashell day is June 20 or 21? I tried to enter the contest but the link didn’t work. Hope to see you shelling sometime.